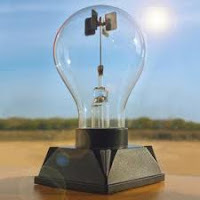 toys-toys-toys.co.uk: History of the Solar Radiometer - How does the Solar Radiometer work? History of the Solar Radiometer - How does the Solar Radiometer work? Also known as The Light Mill and The Crookes Radiometer, the Solar Radiometer was invented in 1873 by English chemist, Sir William Crookes as the by-product of some chemical research. To reduce the effect of air currents he was weighing samples in a partially evacuated chamber and noticed the weighings were disturbed when sunlight shone on the balance. He then when on to investigate this effect and create this device, which is still manufactured and sold as a novelty item over 130 years later! How does the Solar Radiometer work? All that's required to power the Solar Radiometer is radiant light i.e light that gives heat such as sunlight or an incandescent bulb so would work under a lamp or torch as long as heat is given off. The black sides of the windmill warm up the space close to them faster the the shiny sides. This causes the colder molecules to move faster and rush towards the warmer space inside the bulb, creating a pressure imbalance. The windmill then moves to correct the imbalance. The Solar Radiometer contains a partial vacuum, therefore if the glass is cracked it may cause the vacuum to be lost, which will mean the windmill will not turn. The Solar Radiometer is a simple but fascinating way of demonstrating solar energy at home or in a Science lesson!